Works for SK-1, SK-5, SK-8, SK-10, and DM-100 (top keyboard). Available soon for PT-1, VL-1, Yamaha VSS-30 and many others. All features accessible from side of keyboard! User selectable MIDI channel or set it to respond to all MIDI channels. Can also be set to respond to the first MIDI channel received after reset. SK-MIDI retrofit turns on and off with the keyboard. Will not drain the batteries. Responds to MIDI notes 53 to 84. Optional out of range loop feature allows the SK-MIDI to respond to MIDI notes 0 to 127. Best of all – the internal speaker is retained! Casio SK-1 with SK-MIDI retrofit. Rear of SK-1 with SK-MIDI retrofit. 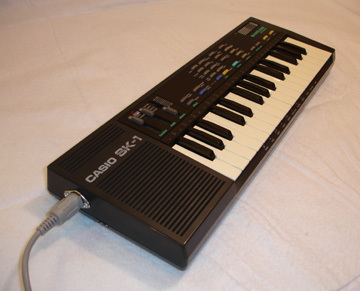 Casio SK-5 with SK-MIDI retrofit. Casio SK-10 with SK-MIDI retrofit. Rear of SK-10 with SK-MIDI retrofit. Typical SK-MIDI installation. In this case it is installed in an SK-10. SK-MIDI retrofit close-up. Again in the SK-10. Close-up of SK-MIDI switches. In this case installed in an SK-5.